Indoor Comfort is a Bryant® Factory Authorized Dealer that specializes in the replacement and servicing of residential heating and cooling equipment. We install over 200 Bryant Heating and Cooling systems per year. Indoor Comfort takes great pride in using the best quality equipment and accessory items from the industry to ensure each and every system preforms to the exact specifications intended by Bryant. Indoor Comfort also has over 65 years of experience in the installation and servicing of residential hot water boilers, steam boilers, and oil furnaces. 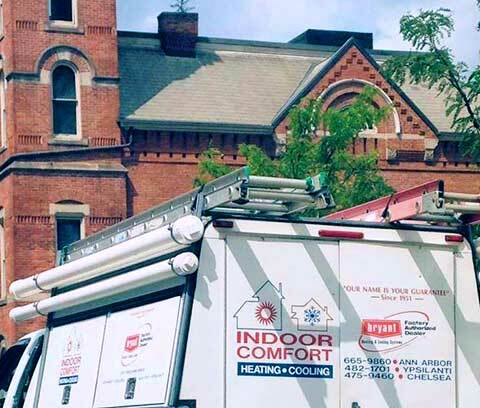 Each and every day our clients from Ann Arbor, Ypsilanti, and the surrounding area trust us to service and install their heating and cooling products. We hope you will consider us for your upcoming needs now and in the future. Indoor Comfort also installs a full line of State® Hot Water tanks, Bryant Ductless Heating and Cooling products, and Honeywell® Residential Standby Generators. Please visit our reviews to see some of the work we have performed in and around your neighborhood. You can also read the numerous reviews that we receive daily from our clients showcasing the amazing quality of work our dedicated team is doing.